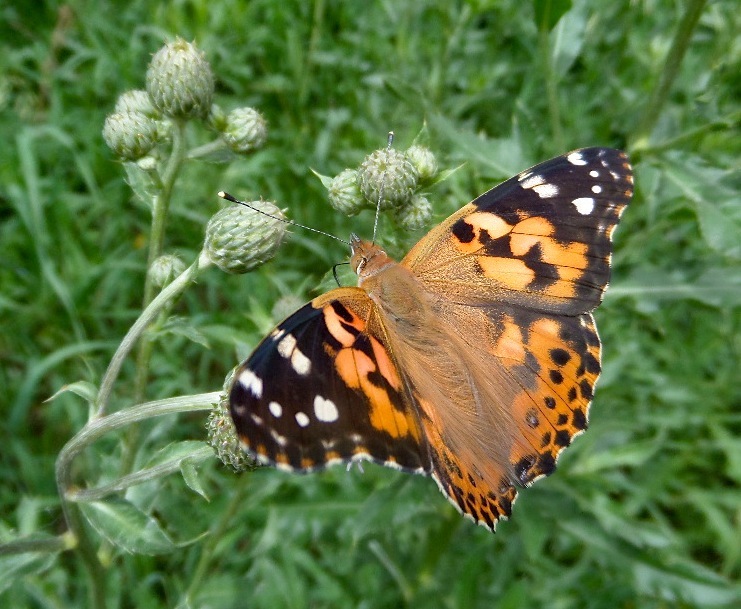 Being deeply immersed in the web of nature’s way over the last four weeks has been an enlightening experience. 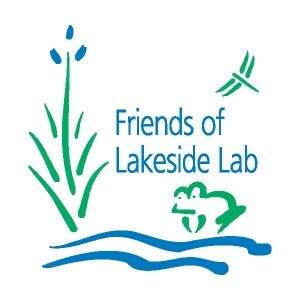 The opportunity to work with and learn from the scientists at Iowa Lakeside Lab has added another educational dimension to this experience for which I am grateful. 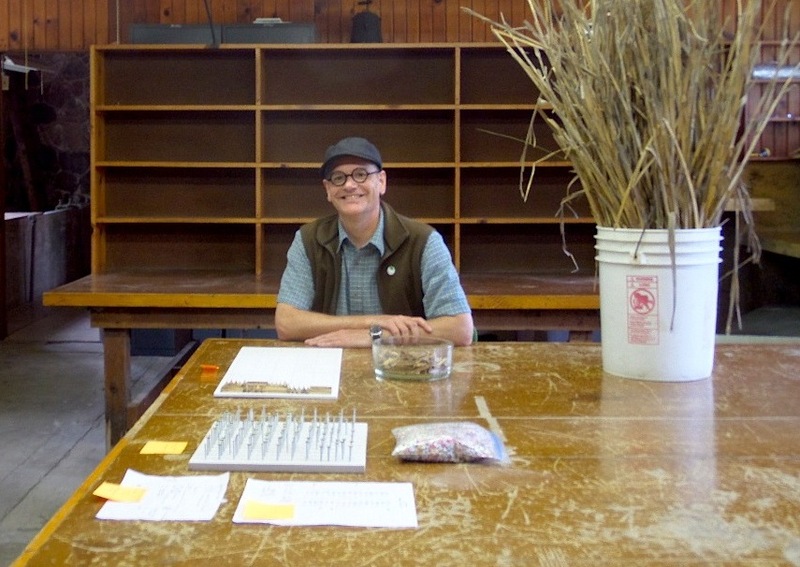 Through self-reflection, contemplation, direct observation, identification guides, classroom participation, field work and my own studio work, I have gained a deeper insight into the ecology of a region in Northwest Iowa known as Okoboji. The insight is encapsulated in the philosophical concept known as Indra’s Net, also referred to as Indra’s Pearls or Indra’s Jewels. It was originally developed by the Mahayana School of Buddhism in the third-century where it described the interconnectedness of all phenomena. In Hindu mythology, Indra was a Vedic god who hung a net over his palace on Mount Meru. This net was a multi-faceted collection of jewels, each jewel created a vertex and each jewel reflected every other jewel. This illustrates the infinite interconnection of all things which can easily be understood when studying ecology. An example of this interconnectedness in Okoboji ecology was recently shared over dinner by a research scientist who is taking daily temperature and dissolved oxygen readings at a nearby wetland. Background about the wetland: In previous years, the marsh had dried up early and vegetation had begun to grow. This year the water level was high and the old vegetation, now submerged on the bottom of the wetland, was decaying. When a dissolved oxygen level was taken in an area near the decaying vegetation it showed nearly no oxygen at all. Only a few feet away, in open water away from the decaying vegetation, the oxygen reading was over 100%. Therefore, bacteria are present in the area of decomposition and other animals in need of oxygen simply avoid it. So, this example shows how an unusual climate change affected the growth of new vegetation, which then decays when submerged a season later, this, in turn, attracts bacteria and repels oxygen-dependent flora and fauna. This intricate web of interrelationship creates a cause and effect pattern that shows the ramifications within the ecology of the wetland. With this in mind, my fourth week began with a flurry of work in the studio. I saw each new work as a jewel added to my net, cast out to connect with others. Ultimately, I am determined to create my own ecosystem of art work (a jewel) that finds a vertex in the vast net of this world. 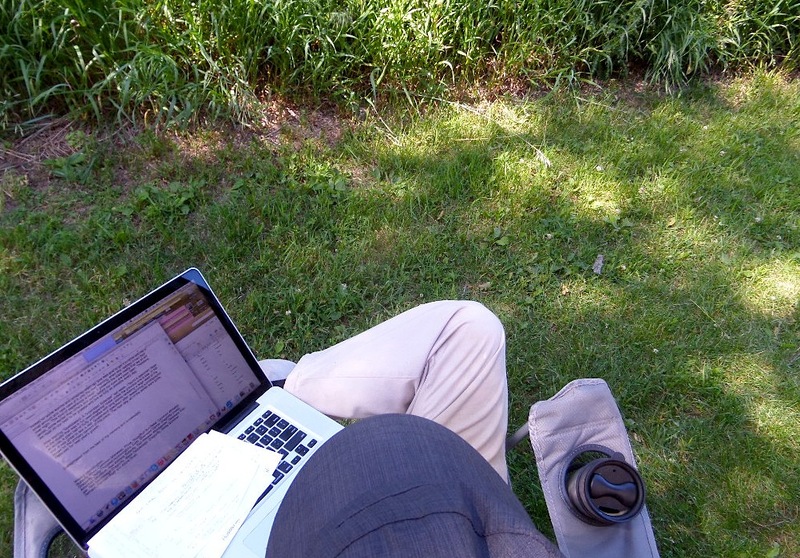 Over the weekend, I spent most of my time writing week three’s report and preparing for the Friends’ Chautauqua Dinner. 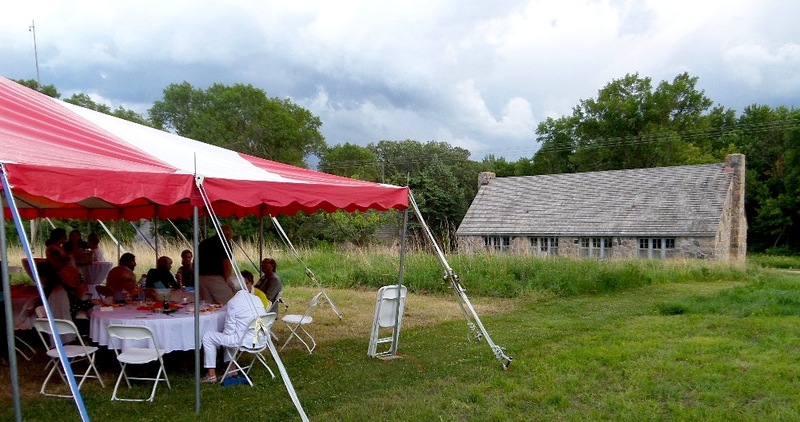 The Chautauqua Dinner was a wonderful time to meet the many donors of Lakeside Lab, those responsible for funding the artist-in-residence program (to whom I am grateful!). So, I presented a few of my new works-in-progress to the donors and answered their questions. This was a great opportunity to share my work with the public and those who made it possible for me to be an artist at Iowa Lakeside Lab. 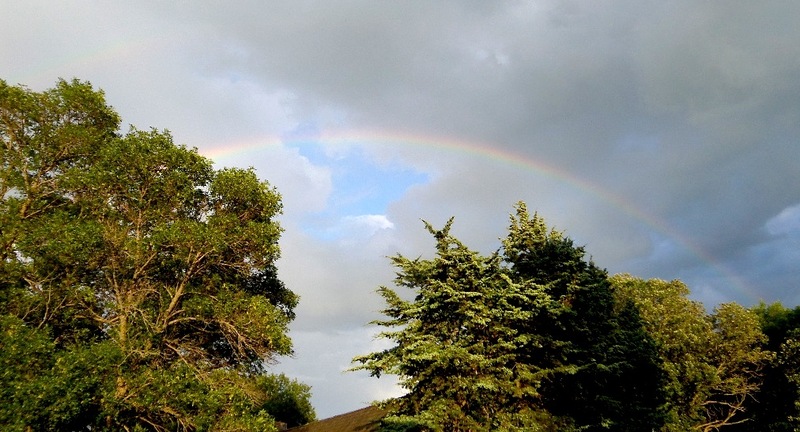 At the end of the dinner, a quick storm blew in leaving a brilliant rainbow directly over my studio. Every few days, I remove some of the old, de-oxygenated water in my aquarium and replace it with fresh water from the lake. 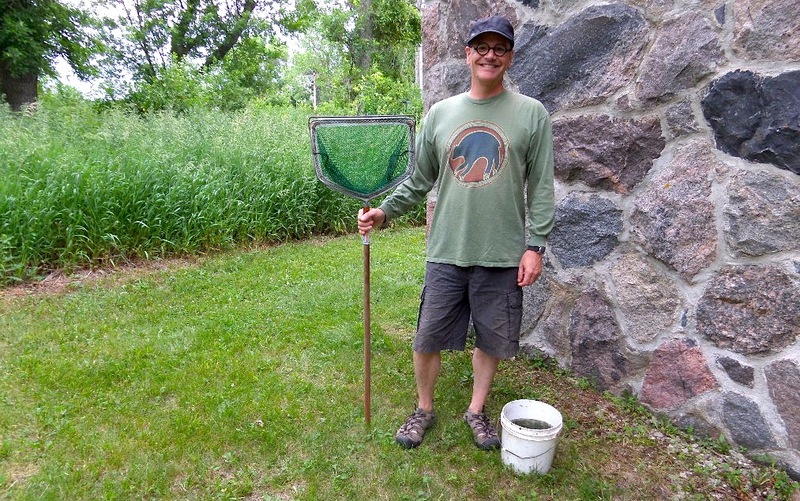 This time, over the weekend, after dumping in the new water, I was amazed at the variety and vibrancy of life in such a small sample: algae, plants, insects, protozoans, crustaceans, mollusks, and fish. There was a flurry of action, creatures swimming about everywhere. 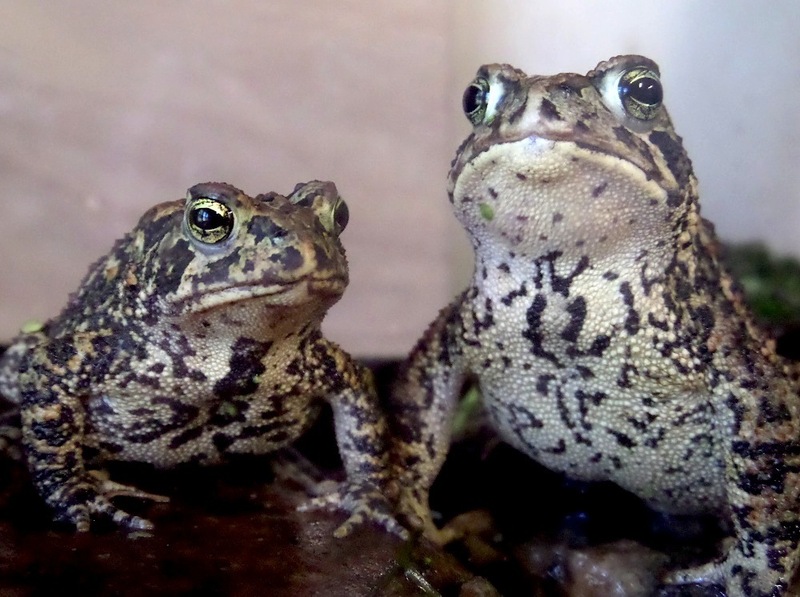 The toads were amused and the tadpoles and salamander had some new food options. 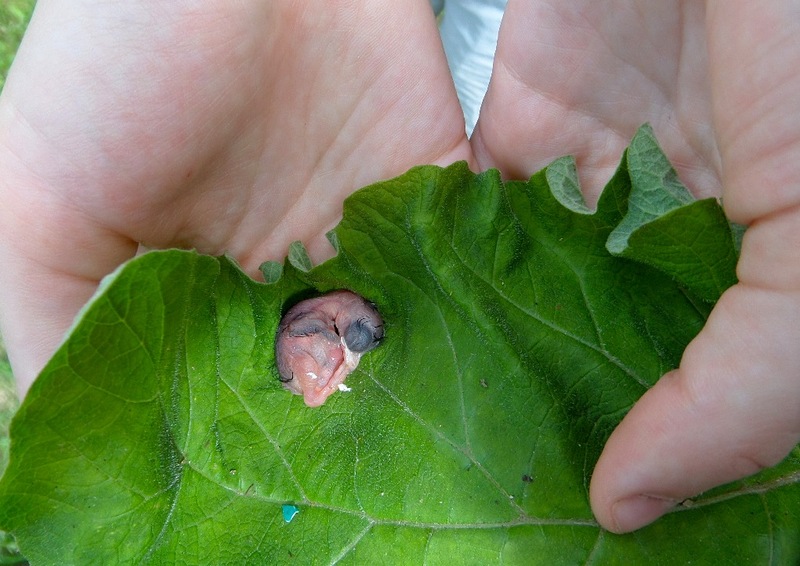 On Sunday afternoon, a student found a baby robin that had fallen out of its nest. It still had egg shell parts attached to its featherless body, its eyes nearly bigger than its skull. She was concerned about it and wanted to take care of it. We talked a little bit about how nature works and that the reason animals have multiple offspring is because a mortality rate can be expected. She wanted to save it though, so we looked for some worms and smashed them up. She was able to get it to drink and eat a small amount and took care of it until the next morning, when she realized it had died over night. This kind of experience is tough. It presents the stark reality that we all will perish, some earlier than others and some before our eyes are even open. Therefore, we must do our best to be grateful and live as fully as possible every day. After starting “Goatsbeard: A Scrambled Side View” last week, I found a specimen close to the studio that was in full fruiting mode, unlike the previous one I saw. In other words, a giant ball of fluffy umbrellas with long stems revealing a large seed at the end. 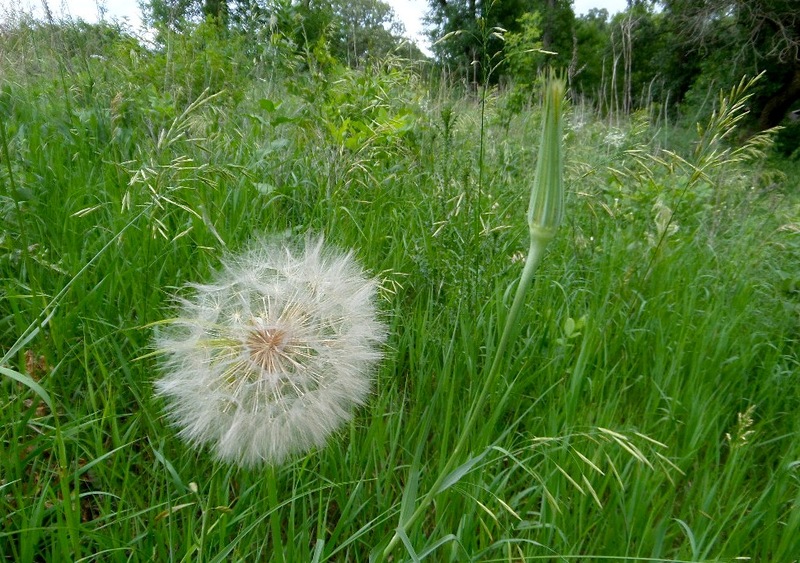 It was great to see a real Goatsbeard specimen after researching a photographic image for the primary content of this piece. The next day, all of the seeds were gone, dispersed for next year’s growth. On Monday, I worked on a number of pieces including “Earth Enso,” “Goatsbeard,” “Be an Island” and “Shiny/Dirty Mantra.” I put a few more coats of white paint on “Earth Enso” and built a frame support for the circular plywood which will allow it to hang and float off of the wall. For “Goatsbeard,” I cut up the green photographic book image of the plant into 1” squares. I also prepared a new back board for “Be an Island.” This piece will consist of a grid of 49 pieces of thin, square wood painted in various colors of water. 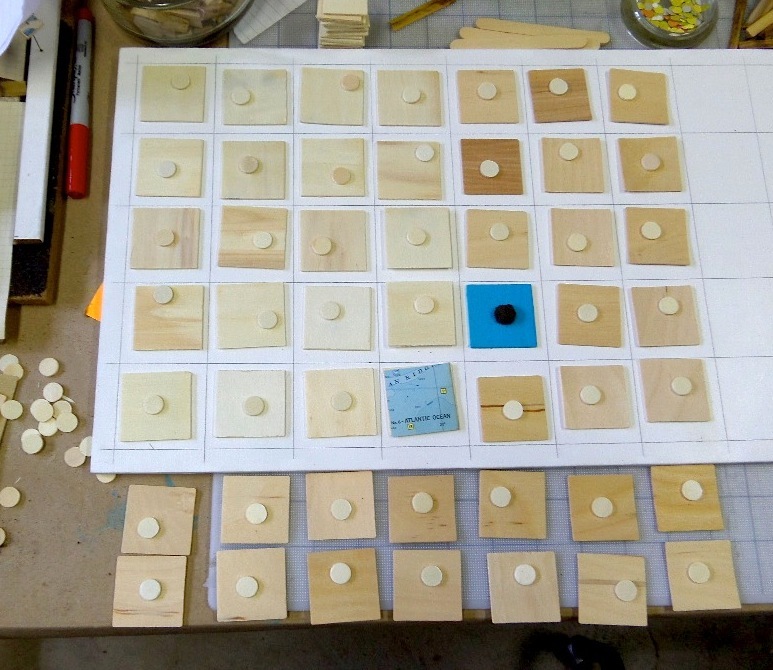 Within each square of wood will be a small dot located randomly. The dot will consist of a small piece of wood coated in various colors and textures of soil. 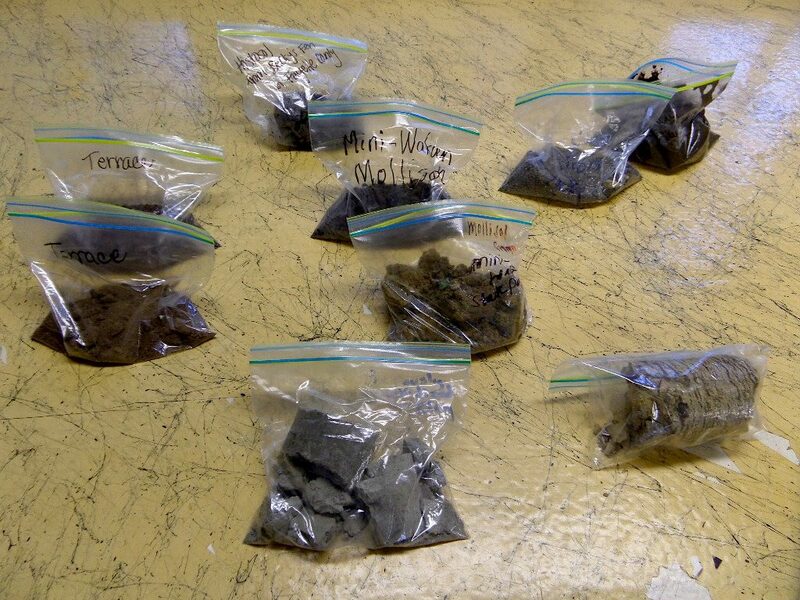 The soil used for this will come from core samples collected by the Soil Formation class. In the evening, I started a new piece called “Impermanence: A Shiny/Dirty Mantra.” This work uses an old dirty rag found in an arroyo out West. 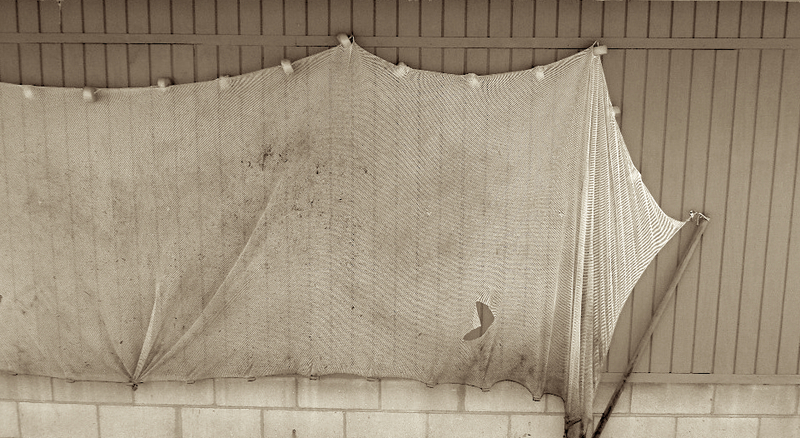 The rag has a polka-dot grid pattern with alternating large and small dots. 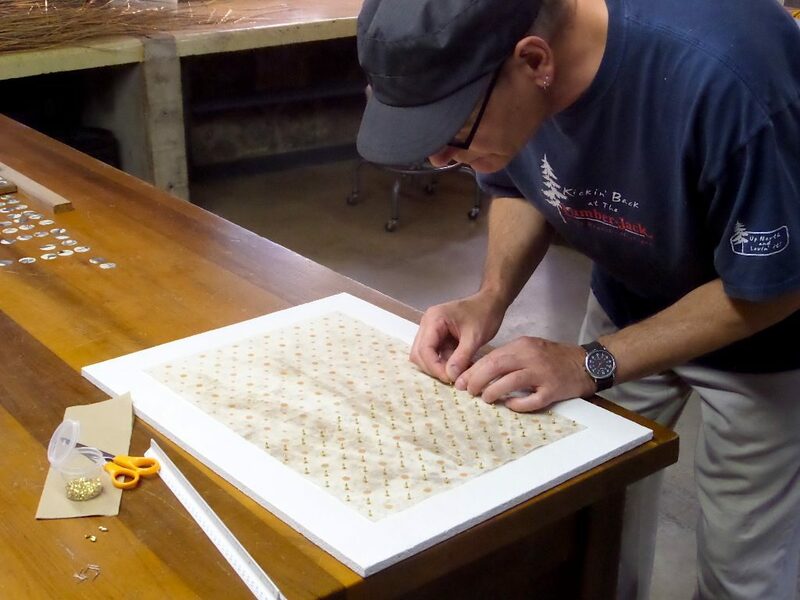 Once the rag was positioned on the white back board, I began pinning large and small gold beads over each of the large and small polka-dots of the rag. The contrast of the shiny gold beads over the dirty orange dots suggests that nothing remains new, in other words, things are always changing, not fixed, but impermanent. 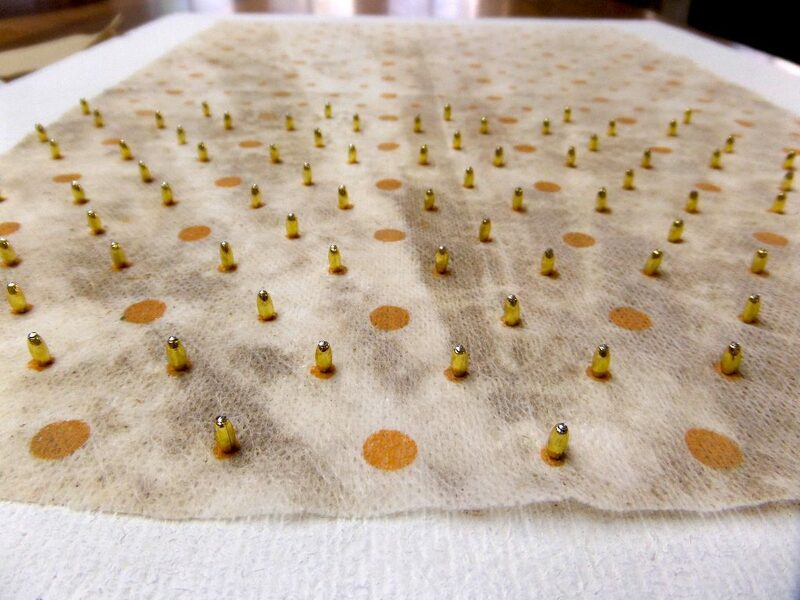 On Tuesday morning, with a sore thumb, I finished pinning over 300 gold beads to “A Shiny/Dirty Mantra.” Interestingly, the way the rag was folded when it was used, created a radial ray of dirt effect, similar to sun rays or plant structures. It is complete except for a wood frame that will be made after I leave. 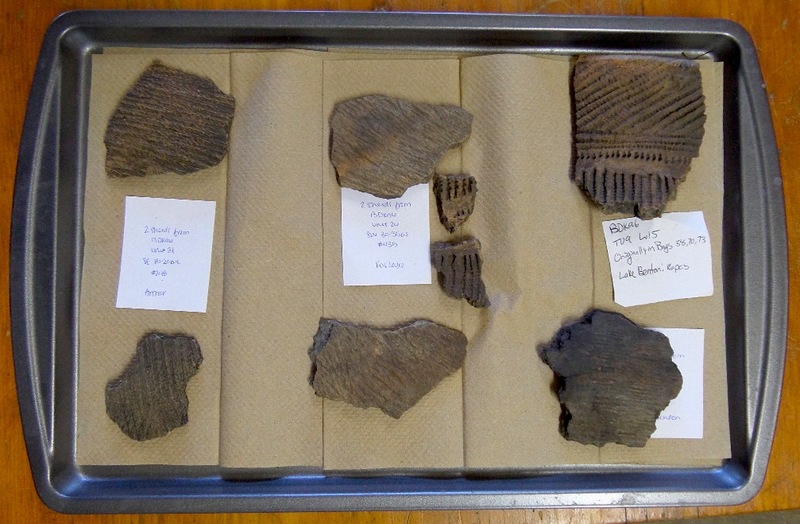 In the afternoon, the archeology teacher shared some of the findings from their current class dig. 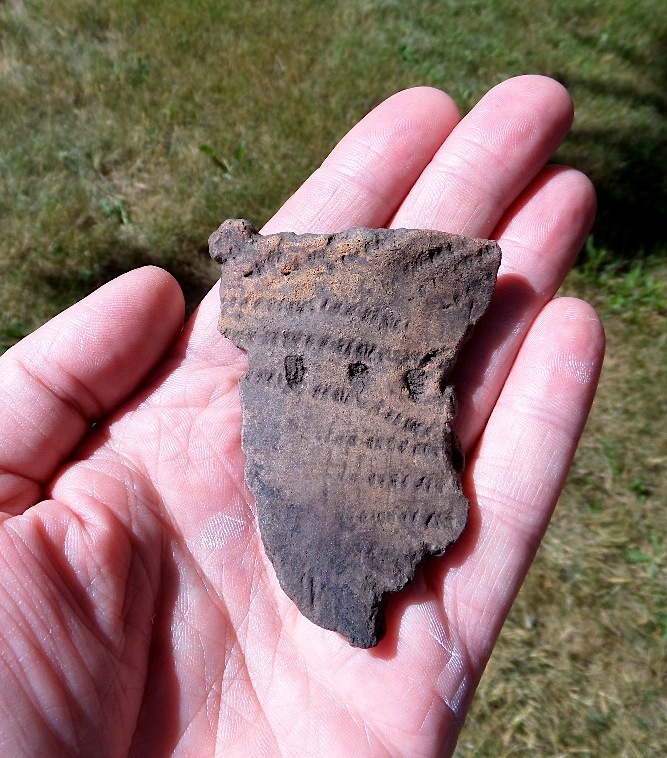 I held a piece of pottery in my hands that someone nearby held in their hands approximately 1500 years ago. The design was created by impressing spun fibers into the clay. Different designs were most likely used to differentiate different tribes. Holding that fragment in my hand, I realized that, 1500 years ago, primitive people still felt the urge to decorate their functional objects with aesthetic markings. I learned that a “sherd” is associated with pottery fragments and a “shard’ is associated with glass fragments. I also learned about the specific coding system used in archeology for identifying findings based on their location and depth. During Tuesday afternoon, I tried to fix a problem with the support housing for “Prairie Grass Collection.” I used old, twisted wood to build a box and, as a result, it does not rest flush against the wall. I tried to run it through the table saw, hoping to fix it, but to no avail. I also did some sketching for “A Beginner’s Compendium to the Animal Kingdom.” I’ve been deliberately letting this piece sit, thinking about it as I pass by, in an effort to try and figure out some ways to improve it. I figured it out today. As a result, I have devised a clever way to better incorporate audience participation which seemed to be a hit at the Open Studio. I will attach each vertical board (one for each letter of the alphabet) of animal images to a top horizontal board with a screw eye and screw hook. 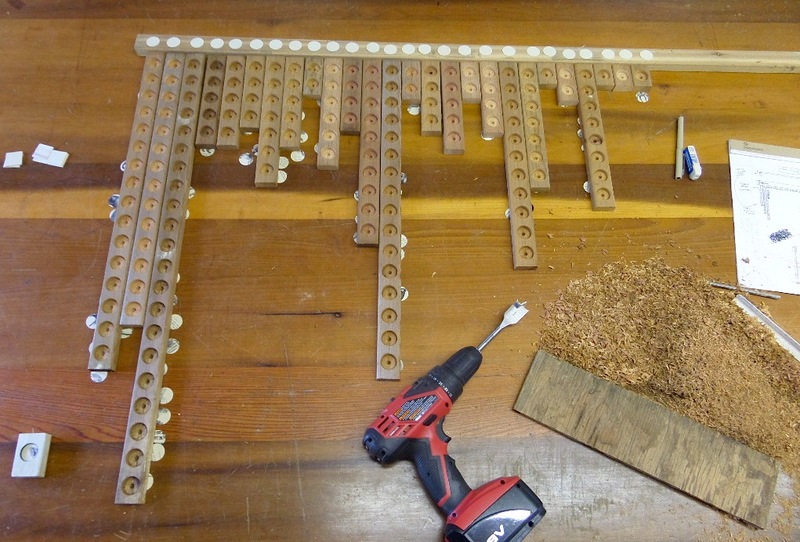 The horizontal board will be attached to the wall and display the letters A–Z in 1” circles. Underneath each letter on the horizontal board will be a screw eye. The corresponding vertical board with images will attach with a screw hook at the top. This will allow for the pieces to be removed. Each animal will be identified with the correct name on the back of the board, so one can easily take the board off and check the name, thus, increasing participation. 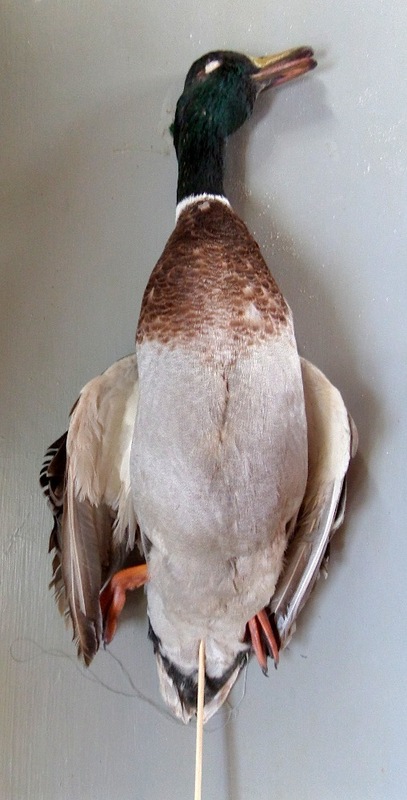 On Wednesday, I had the unique opportunity to skin and stuff a male mallard duck in the Ornithology class. 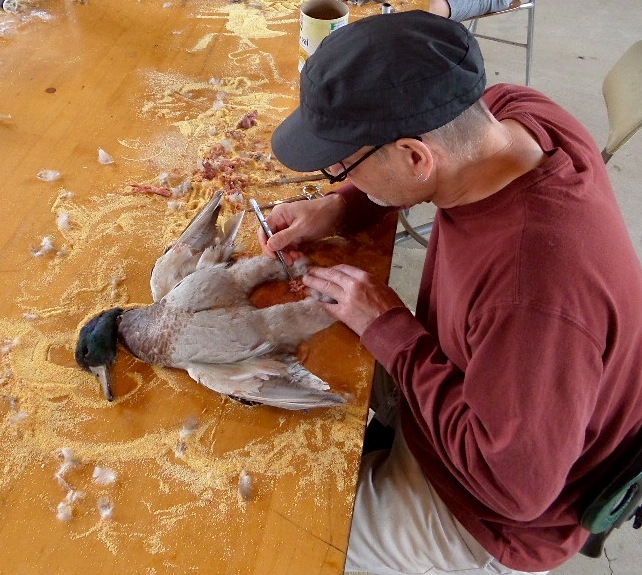 I spent the day learning how to literally turn a bird inside out, leaving only the skin and feathers. This meant there was a beginning incision (from sternum to cloaca), delicate use of scalpel and scissors, then, a lot of difficult finger work to pull the skin away from the back, bone cutting sounds, brain and eye removal, eventually leading to a final sewing up after adding the stuffing and a support stick. I poked a few holes in the skin and cut in the wrong place on the leg bones, but overall it turned out ok for my first time skinning a bird. One certainly gets to know the anatomy of a duck when you have your fingers under their skin. I was also fascinated with a close look at their webbed, reptilian feet. They look just like dinosaur feet, which makes sense, since their feathers are simply adapted forms of dinosaur scales. 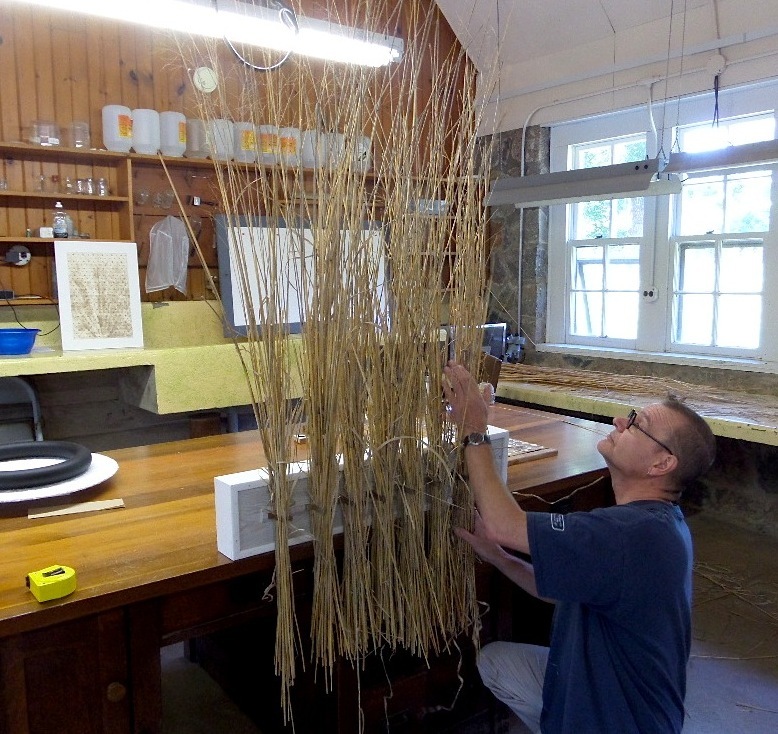 During Thursday morning, I finished cutting the entire bucket of sedges. I now have a lot of sedges ready to go for new work with some ideas floating already around. In the afternoon, I attended Frog Camp with the kids and invited them over to my studio to see the toads and tiger salamander. I showed the kids how I designed and built a natural habitat using a layering technique with soil, old leaves, rocks, moss, sticks and aquatic plants. It was a fun time sharing in the kids’ excitement. 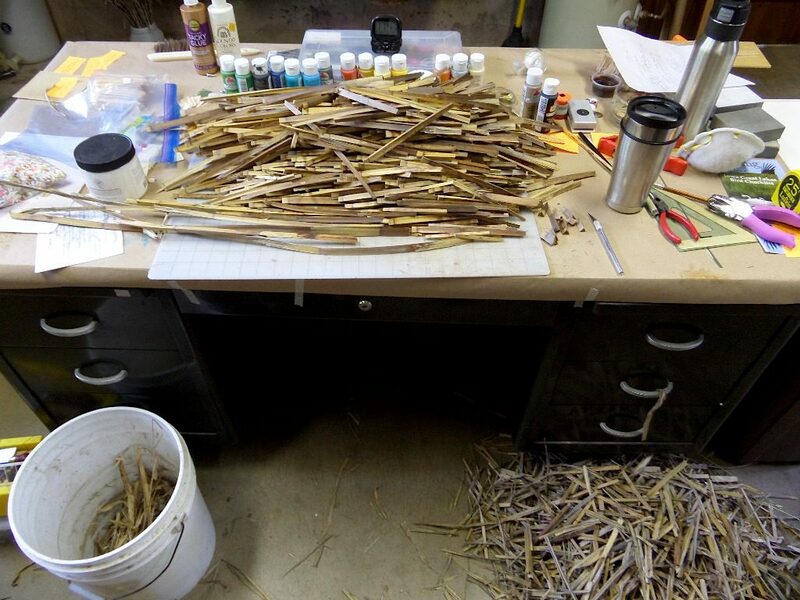 After they left, I prepared several test bindings for “Prairie Grass Collection” until I came up with an excellent solution. On Friday, I began binding my grass collection into the appropriate sized bundles, so they fit snugly into the spring-loaded hardware. 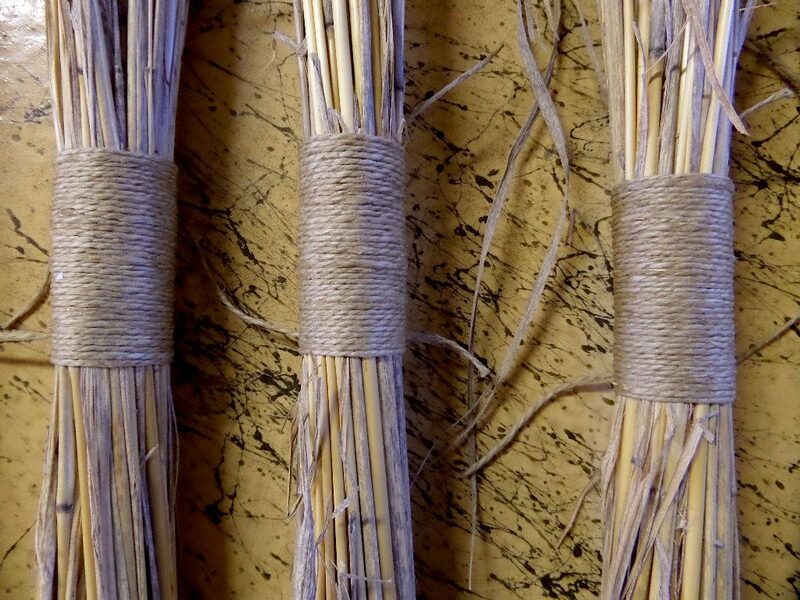 I ended up using jute twine wound tightly around the bundle creating a 2-1/2” binding. After the binding was tied off, I applied acrylic gel medium over the entire twine surface and in between the spacing of twine. This worked great because it added strength to the binding, yet remained flexible to easily fit in and out of the hardware. 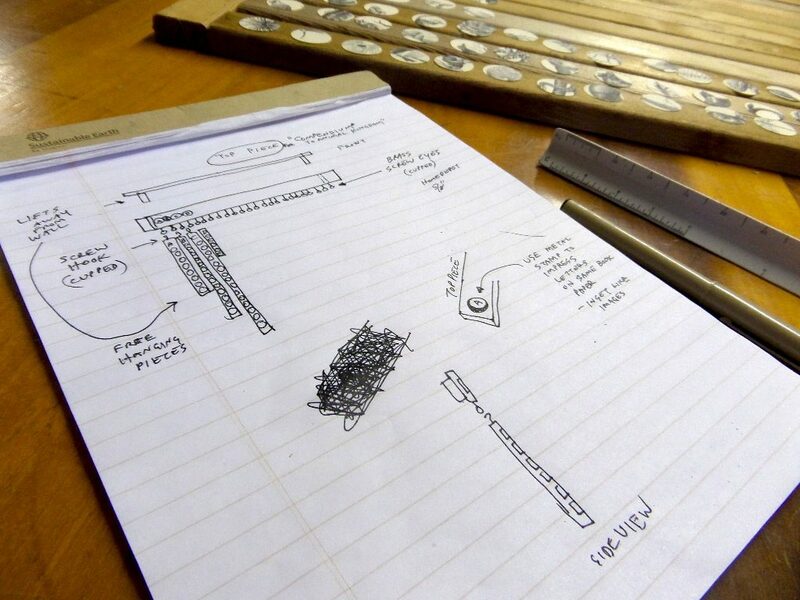 After finishing the bindings, I sat down and toiled over the spacing measurements for “A Beginner’s Compendium to the Animal Kingdom.” After much testing and arranging, I eventually came up with measurements to move forward. At this point, I was able to cut all of the 26 boards to the proper length and pencil in the measurements for the holes. The holes were drilled partially into the board, so that the circular image sits inside of it. By the end of the weekend, I finished drilling over 200 holes, applying wood putty to fix the rough spots and then sanding all of the boards and holes. They are now ready for painting. More tedious work, but well worth it. 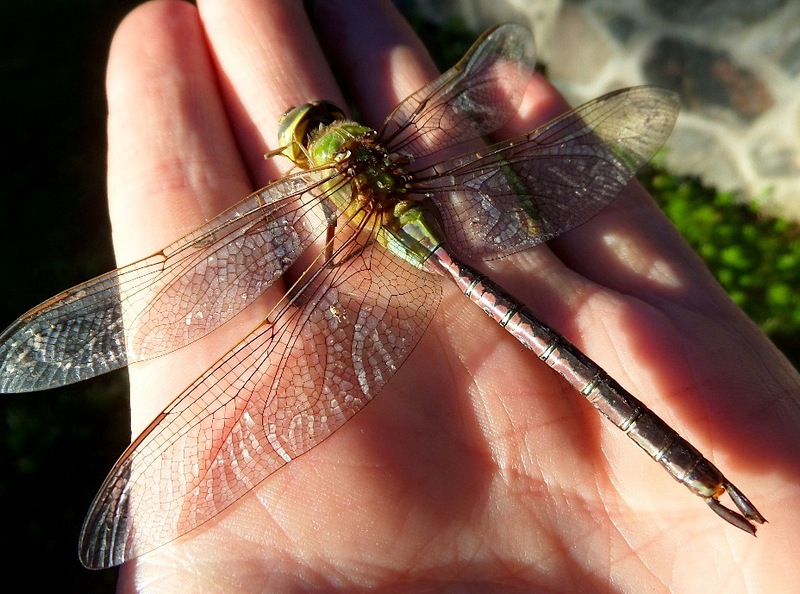 This week’s species identification includes a lot of dragonflies and damsel flies along with some birds and plants: Common Whitetail Dragonfly, Blue-eyed Darner Dragonfly (male), Common Green Darner Dragonfly (male; one of the largest dragonflies), Red Saddlebags Dragonfly, Black Saddlebags Dragonfly, Globe Skimmer (female), Familiar Bluet, Vesper Bluet (male), Azure Bluet, Red Admiral Butterfly, Delaware Skipper, Ruby-Throated Hummingbird, Red-Headed Woodpecker, American Goldfinch, Butterfly Weed, Common Milkweed, Phlox and Broadfruit Bur-Reed.